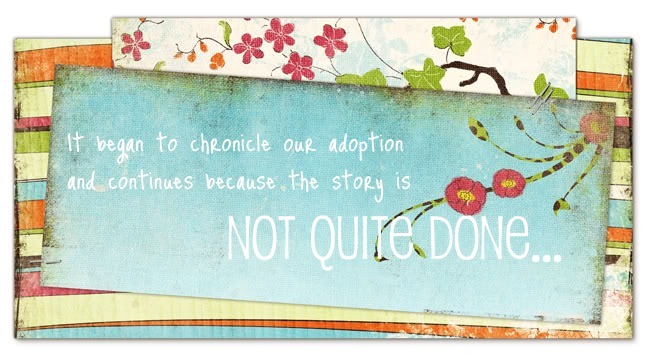 I know that I have been through this adoption waiting thing before. I know that I had an amazing experience in trusting God. I know that I should be able to trust Him this time too. But, I'm starting to falter. We haven't been waiting for an extraordinarily long time, merely 4 months. But, I had it all laid out before we even turned in our paperwork. In my plan we were going to have pictures of our kids by this point and planning a trip to Ethiopia in the next few months to bring them home. That is the problem, it's MY plan. When I get bent out of shape because of the wait, I meet someone who has been waiting longer. A gal at swimming lessons is adopting from China, I won't even tell you how long she's been waiting (because then I'd seem really petty). I will say that she started her paperwork over 2 YEARS ago. That was a reality check. When we wrote our child request, Seth and I were pretty specific, but didn't intend for America World to follow our request in detail. We meant it as a guidline for them, thinking that if they found two children under 3, they would be ours (not worrying about gender or specific ages). We had been wondering if America World knew that we didn't really care if the younger child was a boy or the older a girl. So I called our family coordinator to make sure. I talked to her last week and hung up the phone in a bit of a funk. This is our status: several families are ahead of us in line for siblings. If we would like we could change our request to just one child and move to a different line (a faster line, and be up higher in the line) or keep our request the same and wait...and wait. And possibly wait so long that our paperwork begins to expire. WHAT?! I about fell out when she told me that. Stuff might expire? As in, waiting until next spring, expire? I hung up the phone and just sat there stunned. Then I went about my motherly duties in a fog. I had a moment to briefly relay the conversation to Seth that evening before he headed out for a class. And, still in a funky fog, I did what all girls do when they need an ear and a bit of advice--called my mom. I told her my options and she did what all good moms would do, smacked me around a bit. Mom begins, "Apryl, do you remember how God timed it just right for you to get Ella?" Pitiful me, "Mm, hmm." She continues, "Do you remember WHY you want to have two more children?" Pitiful me, "Yeah..."
And continues to batter me, "What are you going to do if you only get one child?" Sorrowful me, "Probably be racked with guilt when we get to Ethiopia and start paperwork for a second child soon after getting home." She chastens, "And, Apryl, do you really thinking waiting 4 or 5 more months is going to make a difference in the long run?" Chastised me, "No, not really, but Mom..."
And she puts the last nail in the coffin, "Sounds like you know what you should do Apryl, wait on God." Ugh, why does she have to be so right? I should make a disclaimer here, this isn't our agency's fault. They are doing a wonderful job, they told us what the wait times would be, and their main concern is getting the children into homes. So they are unwilling to make an infant wait so that the family requesting an infant and toddler (us) could be referred both. They find the infant a home (with a family requesting only an infant) and the family requesting two kids continues to wait until two children (or siblings) are available at the same time. So, I'm waiting and I'm not being very graceful about it. I'm trying hard to learn from wise people around me and from past experience. I am, evidently, a very slow learner. Even in a small car I have a hard time parking. So one of my concerns in buying this hulking beast of a van was that I may not be able to park it. My fears were realized at Ella's speech therapy appointment yesterday. The parking situation is unreal at the University--small spaces, loads of cars cruising for spots, students racing to class... In my rush to make it on time I forgot about trying to park The Van and nearly freaked out when I got to the parking lot. I managed to find a spot on my *good* side (the left) and only took three tries to negotiate the space. We piled out, inspected my parking job, and all were pleased to see that, though I was crooked, I was well within the yellow lines. Racing off to therapy I forgot about having to pull the whale OUT of the cramped space. A hour later I load the kids into Moby and put it in reverse. Immediately I see a man in a MINI-van behind me. I wave him on, knowing that I'm going to take forever to back out. He refuses to move because he wants my spot. Behind him a line of cars is growing. I throw the van into reverse and lightly tap the gas. We inch back as far as I dare go, then I put it into drive and turn the steering wheel. Tap the gas, move a few inches. Reverse, spin the wheel, tap the gas, move an inch. Drive, turn the wheel, tap the gas, move an inch. I'm making some progress but the line of cars is growing, this incessant wheel turning is causing my...forearms...to....burn...and panic is starting to set in. Will I ever get out, will I have to call someone with big rig experience to help me remove this thing from the tiny space I have put it into? I'm the comic relief in the middle of a so-so movie. Back and forth we go, I really just want to ram the car behind me to give myself some space. Finally, I spin one last time and, with beads of perspiration breaking out across my forehead, I creep forward chanting, "Please, please, please..." hoping not to bump the car next to me. And we are FREE! The kids all chorus and whoop from the rear of the van and I'm elated. Until I remember that Ella has therapy twice a week and we will have to do this again in a few days. I vow to pull the kids to therapy in the wagon until it snows, then I will pull them in a sled, then when I have five children I will strap babies to my body, pull the sled, and still never park that hog at the University again. Sometimes, things just hit you when you least expect it. As we left the beach I was planning what to do when we arrived home, wondering if I had nursery duty the next night at church, all pretty mundane things. Then, two hours into the trip, our van died. Before you picture me in a rusted out 30 year old VW (though that may have brought me home safely), let me say that our van is only 3 years old, so this was unexpected. Thankfully, my sister was caravaning with us for the first three hours of the trip, so she was there to offer much needed wheels and help. The entire scenario was outrageous--we had been in the back country of Alabama, just pulling into a small town (which is a metropolis for the area), just passing an auto parts store when the van stopped working. Seth coasted into a parking space at the store and opened the hood. Immediately the kind man running the store saw we were in need of major assistance and came out to offer his help. His face was pretty grim when he said the awful, hateful, words, "Gotta be yawr transmission." I was completely flabbergasted, are you kidding me, this van is practically NEW (compared to what we have driven in the past), it shouldn't be breaking down this early, its nuts! Then I was struck by how amazing it is that we were in a town, that we were in front of an auto parts store, and not in the middle of the interstate or (possibly worse) on the side of a two lane country road. 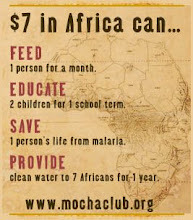 In a seemingly bad situation, still a place to thank God for his mercy and watchcare. Then I looked at Seth and said, "So I guess God has something for us to learn here in Andalusia, Alabama." He smirked and called a tow truck. With Seth on the cell phone, Crystal and I immediately loaded all 5 kids (her 2 and my 3) off to the McD's conveniently located across the street (did I mention this was a metropolis?). Thankfully there was a playplace outside, unfortunately, it smelled like a recent visitor had lost their happy meal on the slide. But desperate times call for desperate measures. And boy were we desperate--the kids had to use the facilities for business beyond *number 1* and they timed it perfectly so that either Crystal or I were "taking care of business" in the restrooms the whole time we were there. We finally abandoned the McD's for a park a bit down the road. We should have stayed at McD's a bit longer, it was one of those mornings--several of the kids had to christen the park (because, of course, who puts potties around a playground where small children who can't hold it may come to play for hours?). On the main stretch of road, next door to Taco Bell and McDonald's, we got the LAST room available at the Best Western. Oddly enough, there was some kind of high school rodeo championship in town, and the only hotel in town was booked, except for one lowly smoking double. My parents made a stop for lunch on their way north, and that afternoon everyone took off for home. Leaving us feeling very alone and strange about being stranded in Alabama without a plan for ever getting home. Saturday night we took a LONG walk to explore the prospect of attending a local church Sunday morning. This turned into serious drama because (little known fact) love-bugs are in season in the South and Ella has a serious bug phobia. I don't use the word "phobia" lightly. She's down-right terrified of anything that closely resembles a bee. All flying insects are bees, she's never been stung by a bee, doesn't know what it feels like, but her imagination has gone into overdrive with this and she expects it to kill her, possibly. I can't figure out an explanation for her frantic screaming whena bug comes near her. We caught these bugs and showed her, killed them and let her touch them, didn't make any difference. As we walked along the sidewalk if anything flying came near us she started shrieking, moaning, wailing, anything aside from swishing her hand in front of her face and saying, "Shoo" as we had instructed her to do. Complete insanity. So we walked down the road, our peace interrupted every few SECONDS by shrill wails of insanity. We found a sign for a church, and Seth scouted out how far it was from the main road so we decided we'd make a visit to them the next day. That turned out to be the best thing we could have done. Sunday when we showed up at this little building, the 30 or so people there greeted us with warm kindness and...curiousity? When they heard our, "Breaking down in the center of town" story they were concerned for us and continued asking if they could do anything at all. We walked out of church holding keys to the building, a promise of a ride back that evening and phone numbers in case we needed other help. These people were beyond a blessing to us. When we got back that night they gave us snacks, gift cards (since we were living on fast food, the only thing within walking distance), and more phone numbers. They were truly acting as the body of Christ, and when we got back to the hotel that evening I was on the verge of tears because of the love I felt from these people we hardly knew. Beyond the church body, the pastor was incredible. This church had recently experienced hard times, and were searching for a new pastor. Seth and I were both amazed by the way God was using this young evangelist in a tiny country church. He was an eloquent, intelligent teacher. We had walked into the situation not expecting very much and God put us in our place immediately. I still don't know why we landed in Andalusia. Maybe our family needed some "forced fun" spending time together in close quarters. Maybe we needed to see this little church, or maybe someone there needed to meet us. We may never figure it out, but we saw that the detours in life can be blessings, if we let them. Back to the title of this LONG story...Moby. Monday morning the town awoke and we rented a car (from the one rental agency in town that just opened a few weeks before our arrival) and called the dealership that had our van. It was going to require about $1500 of repairs and they had two transmission jobs ahead of us. It was probably going to be well over a week before we could pick it up. After much deliberation, possibly some coercing on the part of the dealership owner, we decided to trade our van in on this hulking masterpiece that we have lovingly dubbed "Moby" (Everett wants us to call it Crazy Big Van but we vetoed that one). Here’s a picture of our whole family. Yes, my parents have four daughters. I don't know if my dad was a patient man before children, but spending 20 years with five females certainly made him patient. Take notice of all the grandchildren that are boys, it seems the only way we can add girls to our family is by adoption. I guess God is rewarding my dad for his patience by giving him so many rowdy grandsons. I wish I could write that our trip ended as we expected, leaving Florida and heading back home. It didn’t though, and I’ll leave that for my next post. Ba ba ba bahm, ahhh, a good cliffhanger. 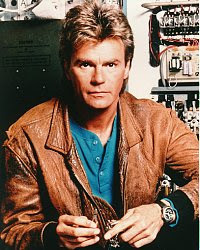 Seth read my post and said, "That picture of Everett makes him look like MacGyver. I guess he could maybe be..."
Happy Birthday to Everett! I think I may blink and find him heading off to college! It seems like it was just yesterday when he and I were living the carefree life-- me and a chubby baby lazing our days away. How things change! Most people have heard the story of the surprise that Everett was to Seth and I. But I'll tell it again, because it's appropriate (and funny for those of you who haven't heard it). When Seth and I were married neither of us wanted kids...ever. Six months into our marriage we went to our Sunday school Christmas party. We were the only childless couple out of the 15 there. Imagine the noise, the squalling, the chaos. Through the din we embarked on a horrid white elephant exchange (in which Seth received a used calender). We were finally relieved to politely excuse ourselves from the torture. I vividly recall walking to the car in the dark and saying, "I am so thankful that we don't have any kids, that was horrible." I was already expecting our first baby. I can only imagine the roaring laughter from heaven when those words came out of my mouth! Isn't God grand? I'm beyond thankful that He saw fit to bless us with a wonderful baby boy (who incidentally slept through the night at 3 weeks). Everett has such a unique character, I'm anxious to see the plans God has for him! This picture warrants a little explanation. Everett has been asking for a pocket knife for years. I guess when he first asked, seven sounded a long way off. When his seventh birthday approached he reminded us that two years ago we told him that he could have a pocket knife. Seth (recalling his favorite childhood memories) went to the store and bought survival gear for a seven year old and a handy dandy knapsack. Though I'm sure it's called something else. For two days Everett has wanted to do nothing but carry the bag around and "fiddle" with his knife (we finally told him that you don't "fiddle" you "whittle"). His big birthday request was granted, and birthday bliss culminated in taking a hike with his dad. The rest of us sort of tagged along. Eli stated that we must bring along a ladder so that Everett could cut down a tree with his new knife. I snapped many pictures including this one, titled: Embarassing little sister discovers a spider is in her hair. Later, when I was looking at the pictures, I found this little gem preceding the "spider in the hair one". Should I title it "Big brother sabotaging Mom's photo shoot by placing spider in sister's hair?" I never get a straight answer on that one, but the photo looks pretty incriminating! Nevertheless, Happy Birthday Everett!